Food and cannabis can be the perfect match. But, let’s be real here: certain kinds of food tend to rule them all—chocolate and hazelnuts being at the top. Nutty, chocolate-packed, and infinitely decadent, adding cannabis to your cocoa hazelnut spread is one of the greatest pairings to be discovered since PB&J. It’s versatile enough to go on just about everything (ice cream, cookies, cake, crackers, you name it), improves even the worst days in mere seconds, and can be eaten straight out of the jar. Because this delectable spread is so delicious, I highly recommend using a low dose of THC for your oil—you may end up eating the jar much more quickly than anticipated. 1. Preheat oven to 350° Spread hazelnuts on a baking sheet and toast for 10-15 minutes. Let cool. 2. Place a towel over the hazelnuts and roll to create friction, removing the skins. Set aside. 3. Melt chocolate (ideally over a double boiler) until shiny and smooth. Add oil and vanilla then mix to combine. 4. Add hazelnuts to a food processor with salt, cocoa, and powdered sugar. Pulse for 2-3 minutes until the mixture resembles a paste. 5. Slowly drizzle in the chocolate mixture, scraping the sides of the bowl as necessary. 6. Add milk until the mixture is desired consistency. Store in a jar at room temperature for up to two weeks. 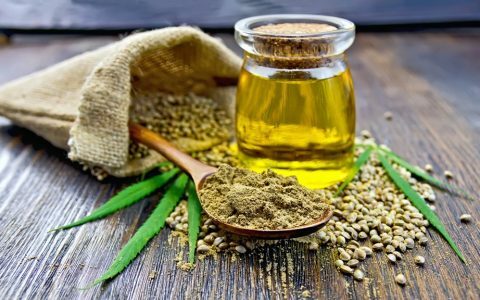 *Note: The amount of cannaoil specified in this recipe is a very loose suggestion; the actual amount you use should be modified based on the strength of your butter and the potency you desire. Dosing homemade edibles can be tricky (click here to learn why), so the best way to test for potency is to start with one portion of a serving, wait one to two hours, then make an informed decision on whether to consume more. Always dose carefully and listen to your body, and never drive under the influence of cannabis.